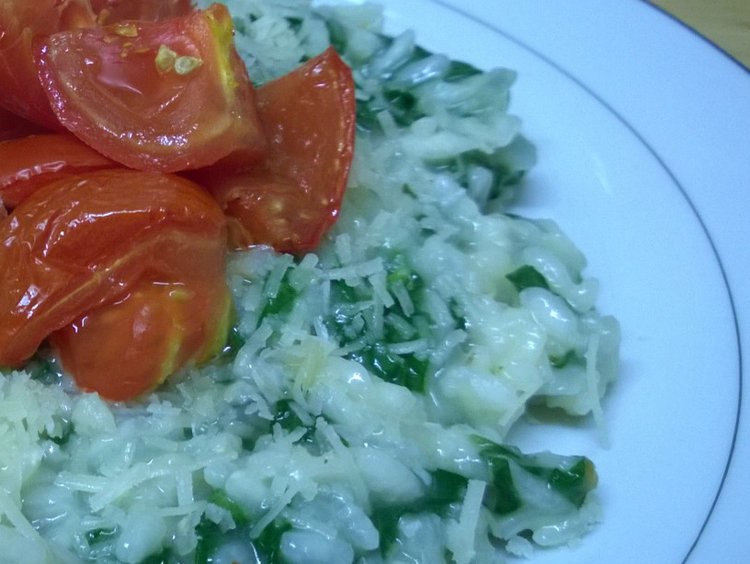 Risotto is all about getting the creaminess and consistency right. To me it’s the perfect consistency if you put a mound of it on a plate and it slowly seeps outwards; if it spreads too fast then it’s too soupy and if it doesn’t move at all then it’s not soupy enough. – 600g Arborio rice (or other short-grained rice suitable for risotto, you won’t get the creaminess if you use regular rice). – Freshly ground black pepper (if your stock isn’t already salted, you’ll need to add salt too). 1. Preheat oven to 180C/350F. Chop the tomatoes into large bite size pieces (or use cherry tomatoes instead), place them on to a lightly oiled baking tray, and drizzle olive oil over them. Set aside. 2. Heat the stock in a pan to a simmer. 3. Melt the butter and about a tablespoon of olive oil in a large pan, add the onions and cook on a low heat for 3 or 4 minutes until they start to soften, add the garlic and cook for 1 or 2 minutes more. 4. Add the rice and stir until the grains are well coated. 5. Add one ladle of the hot stock in to the rice and stir until it is absorbed. Keep doing this, adding one or two ladlefuls at a time and waiting until it is absorbed before adding more liquid. Stir regularly (but not necessarily continuously) throughout the whole process which will take about 20 minutes or so. It should be creamy and a little soupy by the end. 6. About half way through number 5 above, place the tray of tomatoes in the oven to roast, they’ll take about 10-15 mins. 7. Add the lemon juice, pepper, spinach leaves (this is when you discover why you needed a large pan! ), and half the parmesan into the rice. Mix for about 3 minutes until the spinach has wilted. 8. Spoon the risotto into bowls or plates, sprinkle with more parmesan and place some roasted tomatoes on top in the centre of each serving. Eat and enjoy! It doesn’t keep or reheat well, so it’s an eat-it-all-now kind of dish. I wondered why it is that the liquid should be added a little at a time with risotto rather than just adding it all in one go, so I did a little search and found an explanation – when there is only a little liquid in the pan, the grains of rice all stay close together, so as you stir it they rub against each other which helps bring the starch out of them that is needed to create the creaminess. If you were to add all the liquid at once, then when you stirred, the grains would all be dispersed and wouldn’t rub against each other so much. I have no idea if this is correct, but I think it sounds feasible? I had wondered previously whether the reason was just that you couldn’t be completely sure how much stock you would need to achieve the perfect consistency, so you just add it a bit at a time to judge it as you go. Don’t know! I love risotto, but I’ve never been patient enough to try and make it. I only eat it when I go out, but then it’s often a flavor I’m not too interested in. This looks yummy. I don’t think I’ve ever made it before, not that I can remember anyway, but now that I’ve made it once I definitely will again – even though it needs constant attention, it’s all done in half an hour so you don’t need that much patience really! It’s easy to get stuck in a bit of a rut cooking the same things all the time isn’t it, so it’s nice to find things to add to the repertoire! Rissoto is my favorite. Haven’t had it with spinach and tomatoes though. Mushroom, though. Yum. Thanks, Vanessa. I love anything with spinach so this one was always going to be a winner for me! Because it’s quite rich with the creaminess and the parmesan, I found that the acidity of the tomatoes was a nice balance. Nice! I tried risotto once, but it didn’t *quite* come out right. This sounds doable for me, though. Thanks! This one worked for me, whether it will again another time I don’t know! I love a good risotto, but have not had much success with it on my own. Maybe I’m just too impatient with it! I’m impatient, but I’ve discovered that I actually find making risotto quite therapeutic somehow! And it only takes about half an hour, so it’s not long to be patient. I made another one last night, using this as a template but omitted the spinach, and for the liquid instead of vegetable stock and lemon juice, I used canned tomatoes that I cooked right down and combined with chicken stock, and it worked really well, tomatoey and creamy, and I served it with some pieces of cut up spicy sausage on top.